There are several reasons why it might be both valuable and meaningful to speak of an identifiable, single Christology of the ecumenical councils of the ancient church. First let us consider why it might be valuable, and then why meaningful. It might be valuable to speak of such a Christology in order to indicate that the church enjoyed agreement deep and wide during its foundational or classical period; this might in turn provide a solid basis for a theological consensus that could be widely shared among contemporary theologians and churches. This value of classical Christology enters into the “Working Assumptions” of Thomas C. Oden’s Systematic Theology, also known as Classic Christianity, who says that his “purpose is to set forth the classical teaching of the person and work of Jesus Christ on which there has generally been substantial agreement between traditions of East and West, Catholic, Protestant, and Orthodox.” Oden says further that in this approach to theology, he “will be listening intently for the ecumenical consensus that has been gratefully celebrated as reliable Christian teaching by believer of widely varied social locations and cultural settings and periods” (ST vol 2, Word of Life, p. x). 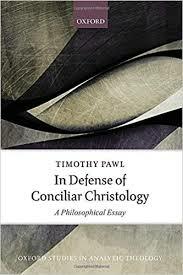 But Tim Pawl’s analytic theology essay in Christology begins with the words, “suppose, for argument’s sake, that those councils got things right.” (p. 4) The reason Pawl’s project starts this way is that he is addressing the second criterion mentioned above: the meaningfulness of a conciliar Christology. Pawl’s Defense of Conciliar Christology is really a remarkable performance. One of the standard complaints against analytic theology includes that it is historically uninformed, but Pawl can be numbered among the practitioners who keep their historical wits about them. It helps that he takes his stand on Thomas Aquinas and then does a decent job with the tradition that led to Thomas. Though he never undertakes to write in a purely historical mode, his ability to engage with the way a historical conversation has developed is on display throughout the book. Some of the same virtues that make for a good narrative of the history of ideas also structure his conversational way of examining doctrines. More remarks soon on Pawl’s particular argument.